"A leader is one who knows the way, goes the way, and shows the way." - John C. Maxwell. 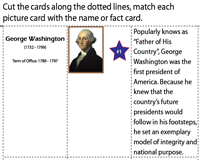 This extensive collection of elementary school worksheets on presidents of the United States features charts, flashcards and a multitude of exercises like presidential firsts quiz and president facts MCQs, chronological list of presidents, identifying the presidents, unscrambling president names, presidents on the currency, who am I? and crossword puzzles, matching game, reading comprehensions and much more. 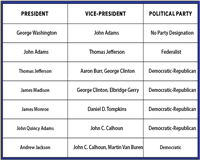 This handout for students of grade 5, vividly displays the names of the 45 presidents of the United States with their respective vice presidents and the political party they belonged to in a tabular format. Know the 45 American presidents more with this timeline guide. 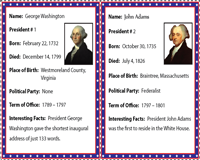 Learn when and where the presidents were born, their term of office and some interesting facts. Make a flashcard for each president's timeline. Reiterate the chronological order of presidents with this crossword puzzle. 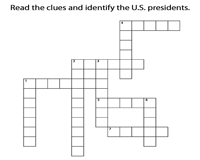 Read the clues and try to remember the presidents by the number and fill the grids of the history crossword for children of grade 3 and grade 4. Are you really a know-it-all? 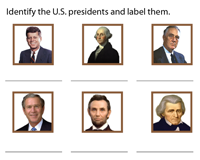 Rattle your brains a little and put your knowledge to test with this presidential firsts quiz worksheet designed for students of grades 4 and 5. Figure out who was the first to do what. 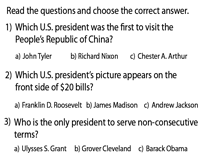 Flex your brain muscles with this presidents-MCQ worksheet. Enrich your knowledge with some interesting facts about the U.S. presidents. Read the fact and choose the president associated with it. 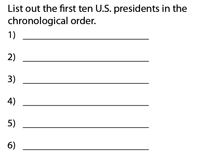 Direct kids of grade 2 to write the names of the first president to the tenth president of the United States in chronological order. Test memory and build general knowledge in the process. 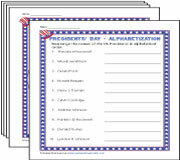 This interesting worksheet comprises the images of 9 prominent U.S. presidents and a word box with their names. Kids of grade 2 identify the president, pick his name from the word box and write in the space provided. 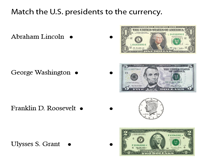 Know which presidents appear on the dollars and coins. Extend learning beyond classrooms with this unique worksheet. Let children recognize the presidents on the coins and bills and match them to their names. This spelling challenge activity helps develop problem-solving and analytical skills. 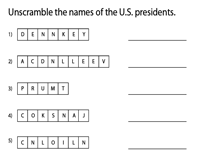 Try and figure out how many president names you can unscramble with this presidents' name unscramble worksheet. U.S Presidents - Who am I? 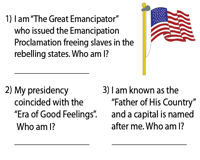 Put your thinking caps on and read an important fact about a president and using the clue identify the president in this 'Who am I?' riddles worksheet. Serves best in recalling facts. Snip the image cards, name cards and fact cards along the dotted lines. Instruct kids of grades 2 and 3 to match the images with the names in level 1 and children of grades 4 and 5 to match the names with facts in level 2. Bolster identification skills in the process. Do you know why the 1st U.S. President didn't smile much? 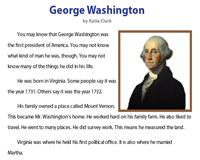 Find answers to many such queries about the Founding Father George Washington with this passage for students of grade 3 and answer questions that follow. Honest Abe's life and achievements is what this passage deals with. Read the passage and analyze the character of this great president and follow up with a worksheet to test comprehension of grade 4 students. 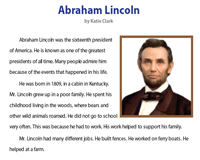 Celebrate this Presidents' Day with worksheets comprising fun activities like coloring, alphabetizing, word search, making words, writing prompts, president research project, math puzzles and more.